Villa Costa Brava - Private 3BR/2BA, Beach Steps Away *4th/7th Nights Free! Awaken to a panoramic view of the Sea of Cortez, one that’s enjoyed from every room of this gorgeous, ranch-style luxury villa. Watch the sunrise from your bedroom, then enjoy breakfast out on the lovely terrace. Perhaps you’ll spend the morning whale watching as you lounge by the pool, or walking for miles along the sandy beach, just steps from your door. For the afternoon, a round of golf awaits you at one of the world-renowned courses nearby. In the evening, entertain your guests on the spacious patio with the services of a private gourmet chef, as your surround-sound home entertainment system sets the mood with your favorite music. Cap off the evening with a relaxing massage, just before the whispering sea lulls you to sleep. The large private pool and deck area is perfect for entertaining or special events. Plan to enjoy a festive party complete with entertainment and the services of a private chef, and when you're ready you can finish off the evening with a relaxing massage all in the privacy of this luxury villa. 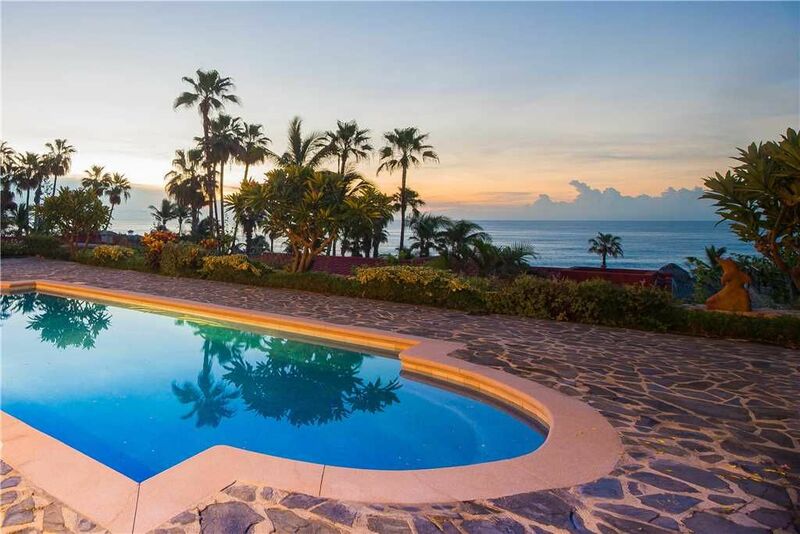 Located midway between Cabo San Lucas and San José del Cabo, this beautifully remodelled villa provides the perfect base for exploring the area. With its splendid, 180-degree view of the Sea of Cortez, it’s a haven for visitors who appreciate luxury, privacy, and stunning natural beauty. When you book this villa with us, you’ll get $600 Value in FREE Extras including: Complimentary beer and water (6 ea), $200 Cabo Expeditions credit good toward activities, 1 Complimentary Arrival Transfer (10 people max, ask us for details), FREE chips, salsa and margaritas on arrival, FREE villa delivery of your AVIS car rental, FREE airport and villa arrival services, FREE 24/7 customer service, A dedicated local concierge during your stay, Best Price Guarantee! Some restrictions apply. Ask us for full details. My wife and I purchased the Villa Costa Brava (built in 1993) just before our son was born 13 years ago. Today our family loves to invite friends to come and enjoy our Baja beach house at Costa Brava. We often get up before the sun rises and take long walks on the beach. Our favorite beach walks include watching turtles hatch, ospreys hunt, pelicans soar, and whales migrate along the Sea of Cortez. In terms of activities our favorites include fishing, swimming and snorkeling at Chileno and Santa Maria Bays, hiking and canyon zip lines, swimming with dolphins, kayaking around the arch and spending time in and on around our pool. We take great pride in keeping our house in excellent condition and provide a quality service which we know that your group will appreciate. Bienvenido! We love Cabo and purchased our house as it is off the beaten track yet just a 10 minute drive to either town. We enjoy our privacy and walks on the beach. Amazing Sea of Cortez views from every room! Lounging on the hammock and around the pool. Watching whales swim by from the pool deck. View more about Don Hirschaut. 3BR/2BA, Master Bedroom - King, 2nd Bedroom - Queen, 3rd Bedroom - Double & Twin, Double Inflatable Bed, Main Features, Panoramic Sea of Cortez views, maid service every other day except Sunday, Outdoor Features, Large private pool deck, Large swimming pool with small kid's pool, Gas BBQ with outdoor sink, Large shaded patio deck, Hammock-6 padded chaise lounges-Patio umbrella, Patio-dining table w/6 high back chairs, Private beach access, Private electric security gate, Private parking. By booking a reservation you agree to sign our Rental Agreement within 24 hours and to all terms and conditions listed in rental agreement. Total guests at any time restricted to contract. Must disclose all guests. High School,College spring break, bachelor/ette groups not permitted w/o approval (fee). Excessive noise not allowed at any time. Quiet time 10pm–10am. NO EVENTS unless pre-authorized & fee paid. You'll find plenty of activities to fill your time in Los Cabos. Cruises, tours, and shopping are just a few of the available options. Or maybe you'd rather just spend the day on the beach with a cool drink and a good book. Whatever you have in mind for your vacation, you'll find it in Los Cabos, including whale watching, diving, golf, sport fishing and great nightlife. Los Cabos is home to the two cities of Cabo San Lucas and San José del Cabo. Cabo San Lucas is an energetic city, with a bustling marina and the iconic stone arch at Land's End. San José del Cabo offers traditional charm, historic architecture and wonderful restaurants. Between the two is the Corridor area, lined with beautiful beaches.